1 Selma Ala. June 8th,, 1865 Thursday Wm A. Hamlin received His pay up to Feby 28" / 65. And got His furlough for 30 days Commencing June 9",,. Co. C. has 4 non-commissioned Officers & 6 privates on Special duty arround this part of Selma, some as Clerks in Commissery. 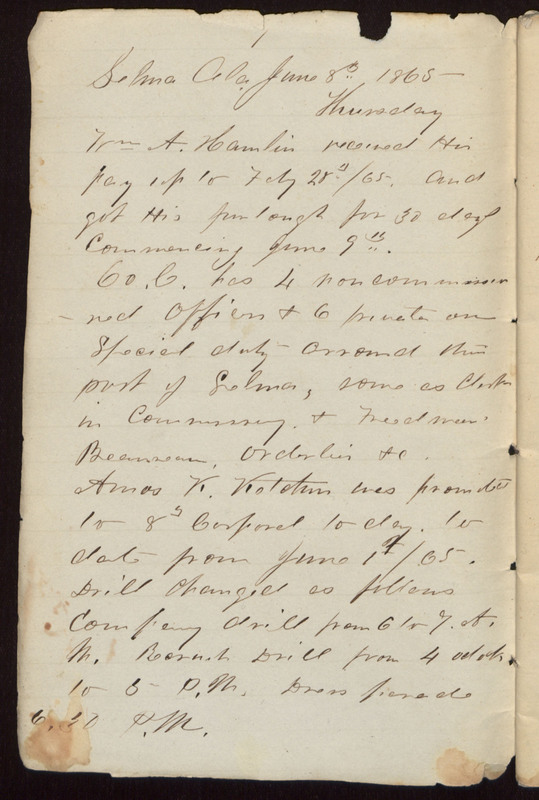 & Freedmens Beaureau, Orderlies &c. Amos K. Ketchum was promoted to 8th Corporel to day. to date from June 1st / 65. Drill Changed as follows Company drill from 6 to 7 A.M. Recruit Drill from 4 oclock to 5 P.M. Dress parade 6,30 P.M.